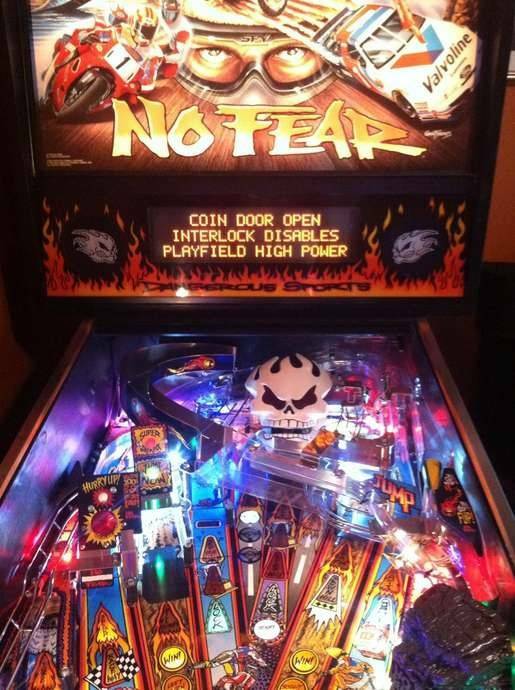 I have a Shadow pinball that is making the "bong" sounds and displaying the Coin Door Open Disabling High Power message during game play. The coin door is indeed shut and the high power never seems to be turned off. It is an intermittent occurrence that sometimes does not happen at all, during the course of a game. When it does happen it lasts from half a "bong" up to several seconds. The game seems to continue as normal, otherwise. I replaced the interlock switches to no avail. Any ideas? I suppose you could always bend the metal flap on the coin door that pushes the switch closed, a little more. No screws, it's welded on Shadow. I have tried to do this. I have lifted the playfield and closed the door just so I could get a look at the metal plate position. I am fairly certain the switches are engaged. I thought this might be a ground issue but I would expect that the high power would indeed be turned off, if that were the case, but all of the solenoids fire as usual. Forget the high power, it's working. Different switch. Work on the memory protect. Wires on it tight ? If you push it in, does the message go away ? If so, it wants to be pushed in more. I will check it out tonight. When I swapped it out for the new switch, there was a little bit of corrosion on the wires. I may not have gotten it all cleaned up. Thanks LTG! I ended up blowing a transistor (u20) on the CPU board. Luckily Williams had it socketed in so I just pulled it out and put in the new chip, fixed. The same symptoms were happening to me, drove me crazy!! Sounds like you are having the same problems. If its the same socketed chip (u20) on the CPU board it's an easy fix. @Castro28, thanks for the advice. Pulled the transistor out of a working machine and popped it in my machine which had this coin door open when it was not open, and it fixed that problem and another problem i was trying to figure out with a row of switches which were not working. Thanks again for the post and knowledge, really helped me out. U20 on a WPC is a 2803 column drive for the matrix. If that was bad; you would have had other switches on the column acting up too. It's not a transistor, it's actually 8 darlingtons. I also have *never* seen one with a socketed U20; someone has changed that along the way. U20 was always getting popped. I am fairly certain the switches are engaged. I thought this might be a ground issue but I would expect that the high power would indeed be turned off, if that were the case, but all of the solenoids fire as usual. It wouldn't be ground. One of the switches is connected to the switch matrix; used to detect if the door is closed. The other just has one side of the solenoid secondary going through it. If the switch that detects the door being closed failed; machine thinks it's open but the solenoids continue to work; the CPU/driver doesn't control the voltage; the interlock physically disconnects the AC before it gets to the driver board. At least that's how I remember all the WPC machines I had my head in worked. I had this exact problem on my JM, and it was a corroded connector. The battery box on WPC-S is mounted above the cabinet switches harness connector, and some previous owner had let the batteries leak on to it. That made the memory protect switch start reporting intermittently.